Register on AmazonSmile.Org & select Garden island Arts Council to receive .05% of your eligible purchases. Who’s Coming Up on Monday March 12? Shortly after the turn of the century, Samuel Kaialiilii Kamaka began crafting koa ukuleles from the basement of his Kaimuki, Hawai’i home. 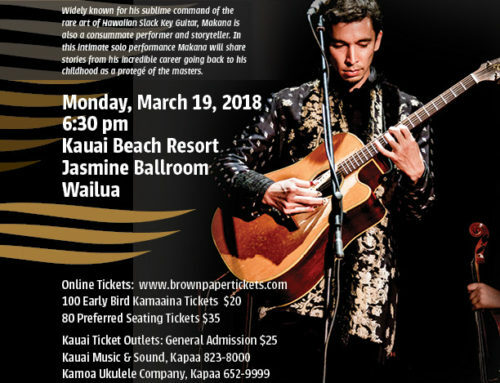 He formed his one-man shop, “Kamaka Ukulele and Guitar Works,” and soon established a solid reputation for making only the highest quality ukuleles. In 1921, Kamaka Ukulele established a shop at 1814 South King Street. In the mid-20s, Sam Kamaka laid out a pattern for a new oval- shaped ukulele body. His friends remarked that it looked like a pineapple, so one of Sam’s artist friends painted the front to duplicate the tropical fruit. A few years later in 1928, Sam Kamaka patented the design. Thus began the original Pineapple Ukulele, which produced a resonant, mellow sound distinct from the traditional figure-eight. The Pineapple Ukulele became an instant success worldwide, and continues to be Kamaka’s signature ukulele to this day. During the 30s, Sam Sr. introduced his two sons, Samuel Jr. and Frederick, to the craft of ukulele-making, even though the boys were only in elementary school. In 1945, the business was reorganized as “Kamaka and Sons Enterprises.” Sam Jr. and Fred Sr. were then drafted into the Army, and after serving in WWII, both brothers attended college on the GI bill. After graduating from Washington State University, Fred Sr. began a career in the Army, while Sam Jr. earned a masters degree and went on to pursue a doctorate in entomology at Oregon State University. In 1952, due to illness, Sam Sr. went into semi-retirement and hauled his equipment to his Lualualei Homestead farm in Waianae. When he became seriously ill the following year, Sam Jr. abandoned his studies and moved back to Hawaii to care for his father. Sam Sr. died in December 1953, after hand-crafting koa ukuleles for over 40 years. Immediately following Sam Sr.’s death, Sam Jr. put aside his personal career aspirations to continue the family business. Building on the knowledge he had picked up from his father, Sam Jr. restored the factory at the previous 1814 S. King Streetlocation. Five years later in 1959, the company expanded to its current location at 550 South Street. Kamaka and Sons incorporated in 1968 and became “Kamaka Hawaii, Inc.” After retiring from the Army in 1972, Fred Sr. joined the business as its general manager. Along the way, Sam Jr.’s sons, Chris and Casey, also got involved with the company as did Fred Sr.’s son, Fred Jr. The sons now play major roles at Kamaka Hawaii, Inc.: Chris is the production manager, Casey crafts the custom orders, and Fred Jr. is the business manager. Other young family members are also helping with the business, carrying the Kamaka tradition into the fourth generation. 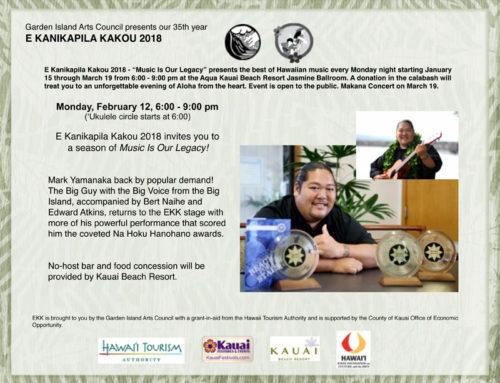 Kamaka Hawaii, Inc. will have their instruments and other ‘ukulele supplies available for sale at EKK on March 12 with a portion of the sales to benefit EKK. Lady Ipo Kahaunaele-Ferreira led the ‘ukulele circle workshop at the beginning of the evening and had her class come up for their ho’ike immediately after. They sang and played E Naughty Naughty Mai Nei by Mel Peterson, uncle of Jeff Peterson. They also shared a song that Lady Ipo had written as a gift for Deanna Sanders who started coming to EKK in 2012. She is the boss of the Humboldt ‘Ukulele Group that numbers 50 regular and 50 alumni with over 100+ Facebook members worldwide; they play songs they learned at EKK for nursing homes and fundraisers, sending seeds of Aloha all over the planet. Wow! Kuhio Travis is not yet a recording star with huge name recognition, but he put on a great show at EKK. A self-taught musician, he spent his childhood years growing up in Waimea and Koloa. He spent a lot of time with his grandfather who worked at the garden and kept Kuhio occupied with the AM radio; his favorite thing was to mimic commercials. He always loved to sing but at age 10, while in the 5th grade, he started to learn to play the ‘ukulele because his friend was getting a lot of attention from classmates playing on his ‘ukulele. He taught himself to play on a borrowed ‘ukulele. He later moved to Laupahoehoe on Hawai’i Island where he had a lot of time to perfect his ‘ukulele playing and singing. Age 21 he returned to Kaua’i and his first job was at Smith’s Boat as an entertainer where he learned a lot on the job from the other Hawaiian musicians. He has been entertaining ever since. Today he lives in Waipahu and performs at Turtle Bay Resort and Kona Brewing in Waikiki. He spends summers in Washington State recording music. His tiny one-of-a-kind ‘ukulele is a powerhouse instrument, custom built by a civil engineer in Washington who makes experimental instruments as a hobby. It’s a solid body electric ‘ukulele with built-in controls for on-board distortion effects. Kuhio really rips on his ‘ukulele, his instrument of choice. He has an eclectic repertoire and loves the different era of music more than any single song or artist. It’s difficult to describe how he sings . . . you just need to be there to experience his music; he interprets the song in his own style, often doing the instrumental parts with just the sound of his voice. He’s playful and confident and loves performing. The one Hawaiian song he chose to sing was Holei about Kalapana on Hawai’i Island, a song that we have heard for the fourth time this season, each time a stellar performance. It was not the usual falsetto version but very powerful in his lower register. Clearly, Bruddah Iz had a great influence on his choice of Hawaiian music as he sangWhite Sandy Beach, the first song he learned to pick, Hawaiian Superman preceded by some Led Zeppelin-inspired sounds on his tiny ‘ukulele, and Somewhere Over the Rainbow . . . always an audience favorite. Van Morrison’s Into the Mystic was followed by Crazy Without You performed by Pure Heart. The latter song was written by Alvin Loan and Lucas Estrada. Not only does his little ‘ukulele make great sounds, he can do the same thing with his own voice and he introduced the popular song recorded by Phil Phillips, the Honey Drippers and a host of other artists. Sea of Love as sung by Kuhio was lighthearted and humorous, ending the song with bugle taps. Continuing the journey into the contemporary, he performed Wild World by Cat Stevens from the album Tea for the Tillerman followed by Breathe. His personal favorite song,Englishman in New York from the Very Best of Sting album was quite inspirational. From the album The Very Best of the Righteous Brothers, he sang Unchained Melody, a 1955 song by Alex North with lyrics by Hy Zaret. It’s one of the most recorded songs in the 20th Century. Elvis and Iz both performed this classic song. Thank you, Kuhio, for bringing nostalgia back to us. Wishing a happy birthday for his Cousin Noe whose birthday is 3/1/84 and his own birthday is 1/3/84; Kuhio said this makes her birthday easy to remember. He dedicatedStand by Me, a 1961 song by Ben E. King of the Drifters to Noe. Inspired by a spiritual hymn titled Lord Stand by Me, this song was #122 on the Rolling Stones 500 Greatest Songs of All Times. In the year 2000, it was proclaimed the 4th most performed song of the 20th Century with over seven million performances. Wow! Kuhio does fun stuff with his medleys by putting together songs that you would not expect to hear together – Eddy Grant’s 1988 anti-apartheid song, Gimme Hope Jo’Anna, and Van Morrison’s Brown Eyed Girl from his Blowing Your Mind album was skillfully woven together. It was fun hearing him change the lyrics to fit his sense of humor. Tonight in falsetto complete with playful sound effects, to Kiss the Girl from Little Mermaid to the very catchy Hakuna Matata and Bob Marley’s Three Little Birds and back to Lion Sleeps Tonight. Charming and the audience just loved it. As always, we took some time to show off the Kamoa ‘ukulele that was going to be given away to one lucky winner. Lady Ipo said she would give a one-hour lesson to whoever wins the instrument. She played the Kamoa ‘ukulele, singing Beautiful Kaua’i while Elena Gillespie and Madeleine Guyett went onstage to dance the hula. The lucky winner of the ‘ukulele was Gordon Furze from Kilauea. Double lucky guy to win the ‘ukulele and Lady Ipo’s ‘ukulele lesson. Continuing with his combining awesome contemporary songs, Kuhio started off withHawaiian Kick Boxer which led up to Carol Douglas’s Kung Fu Fighting on the 1999 The Soul of the Kung Fu Fighter followed by Get Down On It on the album, The Best of Kool and the Gang. Out of the blue he started singing the Mickey Mouse Song that was a favorite of kids to introduce the next song, Jacob Miller’s All Night Till Daylight and went right into John Denver’s original Take Me Home Country Road, also sang by Bruddah Iz. He had fun altering the lyrics by changing West Virginia to West Kaua’i, his ol’ home town, and slipping in Mount Ka’ala and some other local place names. Shouts of hana hou rang out as the evening was winding down. Out of the clear blue he started singing Home on the Range which was the prelude to the most incredible yodeling song called SOLD! (The Grundy Country Auction Incident) by John Michael Montgomery. Written in 1995 by Richard Fargas and Robb Royer, this song was the top country song in 1995 and Kuhio Travis WOW’ed the audience with his fast-fast-fast ‘ukulele playing and his tongue-twisting auctioneer’s yodeling. That was the hana hou to end all hana hou . . . can’t believe he was still standing when he was pau. So another Monday night was history with everyone joining hands and singing Hawai’i Aloha. With just two more EKK Mondays, folks were already beginning to feel sad. 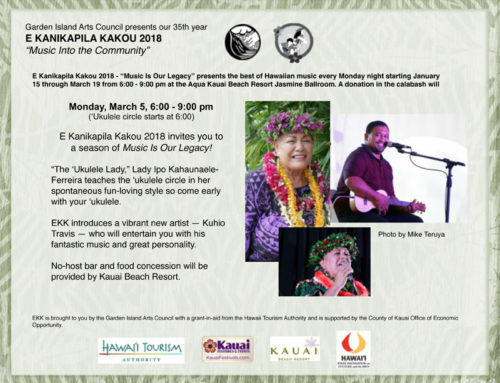 E Kanikapila Kakou 2018 Hawaiian Music Program is funded in part by the Hawai’i Tourism Authority, supported by the County of Kaua’i Office of Economic Development, the Kaua’i Beach Resort, and the GIAC/EKK supporters. Garden Island Arts Council programs are supported in part by the State Foundation on Culture and the Arts through appropriations from the Hawai’i State Legislature and the National Endowment for the Arts.